Here are 3 miniature quilts I entered in our recent Dakota County Star Quilters quilt show. 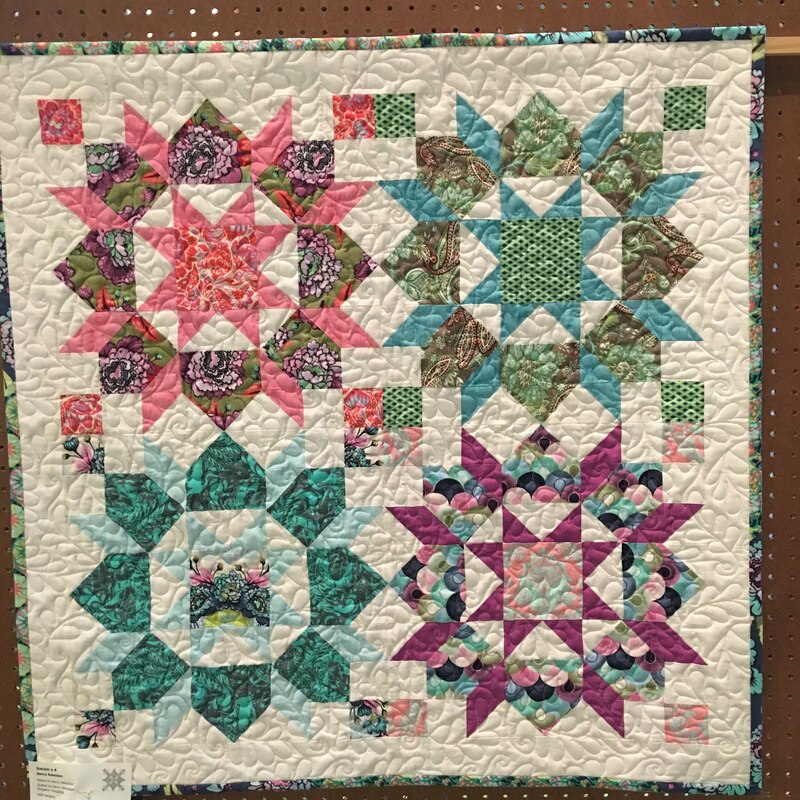 This quilt was a "Challenge Quilt" entry. The challenge: use fabrics that you bought in last year's quilt show "country store". This was part of a kit of 1 1/2" strips. I did not use the pattern that came with it. Instead, I made a quilt from Gudrun Erla's book, Stripology 2, which is made for 1 1/2" strips. Gudrun was our quilt show guest speaker this year. I quilted it with the edge-to-edge design called "Slick". 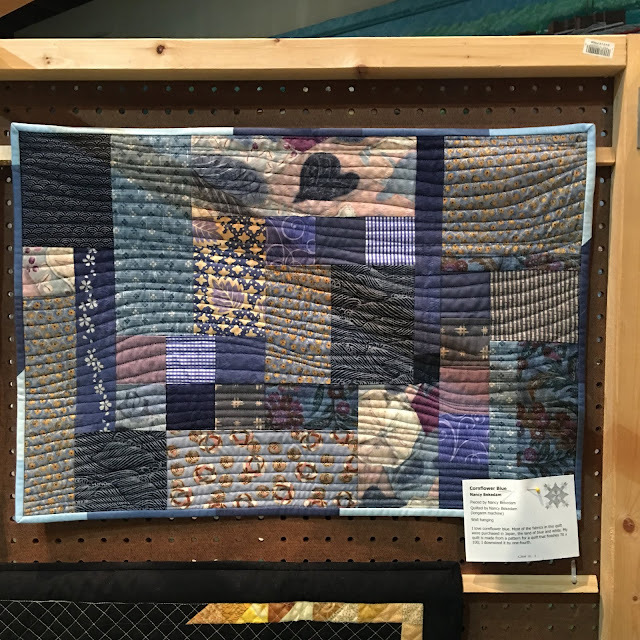 This quilt was part of our "Crayon challenge" category--draw a crayon from the basket and make a quilt using tints and shades of that color. I drew a Cornflower crayon. Most of the fabrics I used were purchased in Japan. The pattern is "All Nighter" by Debbie Bowles of Maple Island Quilts, from her book Quilts For the Dorm. I made it 1/4 the original size. I quilted it with freehand undulating lines. This next quilt was part of the "Ugly Fabric Challenge". Everyone who put in an "ugly" fabric drew another one back out and made a quilt. I loved the fabric I picked, as did many of the participants. It is the green paisley fabric in the upper right hand block. The quilt is the "Swoon" pattern, also know as Dutch Rose. 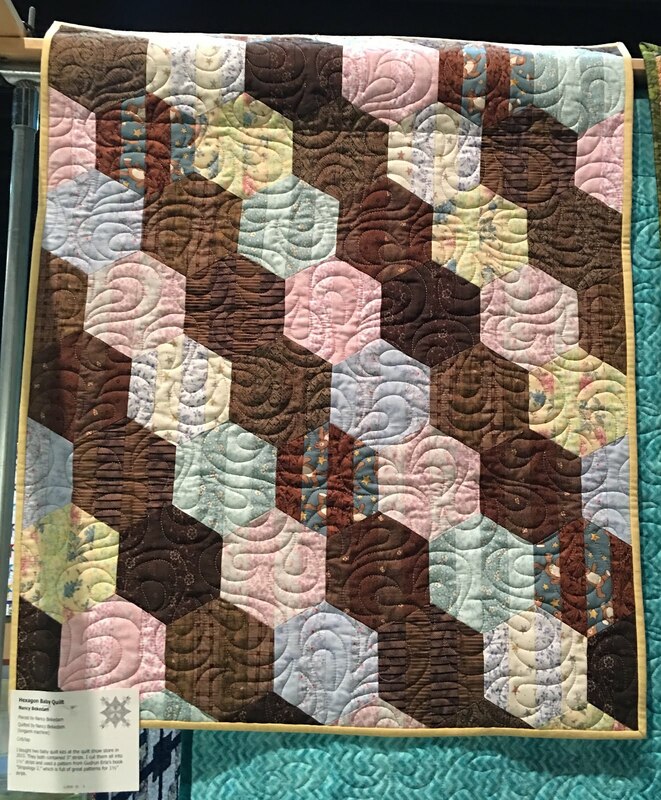 I quilted it with the edge-to-edge design called "Feathered Curls" and two layers of batting.